The Empire Strikes Back…the Obama Death Star BusTour! What’s with the black bus? Is it supposed to instill fear into the hearts of Middle America or just intimidate the Republicans running for president who were gathered in Iowa? According to the White House, the President decided to go on a bus tour in the Midwest to get away from Washington and get back in touch with the people. Interestingly enough, the three cities that he’s visited so far all have 6% unemployment versus the national average of 9.2%. Amazing coincidence or what? I was really taken by the bus however, a custom built jet black monster with tinted windows that reminds me of Darth Vader and the Death Star. The President definitely wins the best bus award, hands down, among all of the Presidential candidates. This vehicle and its caravan of secret service black SUV’s, rolling along the Iowa countryside, is intimidating as hell. No message of “hope and change” here but rather, “don’t mess with me”. A throwback to Chicago politics at its best. Who are the geniuses in the administration who thought this thing up? 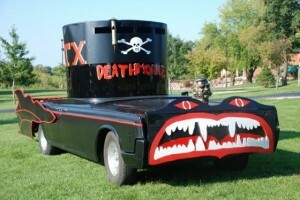 Did the brain trust really think that driving this menacing black vehicle would be inspirational? Perhaps it was just to frighten the likes of Rick Perry and Michelle Bachmann. Or, giving the President the benefit of the doubt, maybe the bus looks this way because it’s employing a new kind of stealth technology. Was this form of intimidation really necessary in the Iowa cornfields? Anyone here interested in hope and change? If the President is truly serious about projecting this new image, he should have Air Force one painted jet black as well. Now that would be something! The Darth Vader Death Star striking fear into the hearts of enemies and friends alike as it lands on foreign soil for state visits. Alas, this is not to be. 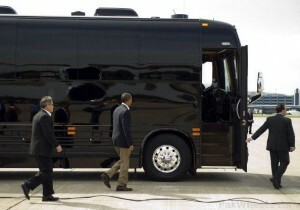 It turns out the Presidential bus is just a poorly executed rip-off of an old movie prop. Next to the brightly and patriotically painted buses of the Republican candidates it reminiscent of the scene in “Animal House” where the “ DeathMobile” driven by Bluto (John Belushi) and D-Day (Bruce McGill) goes on a rampage to wreak havoc on a homecoming parade. Sadly, the occupant of the Death Star is the same Barack Obama, making short stops, talking about the non existent jobs which he’s created and blaming everyone and every conceivable act of god for being unable to deliver on his promises. He always utters his famous statement “I think about jobs every morning when I wake up and every night before I go to sleep.” Who’s jobs is he thinking about? His? With that he gets back into the Death Star and rolls on to the next town. Martha's Vineyard is full of people who own private jets! After this whirlwind strike by the Empire, the President is on his way to Martha’s Vineyard for a well deserved vacation and to rub shoulders with the liberal elite. Now to my way of thinking, if he really wanted to make a splash he should ride the Death Star into the Vineyard. 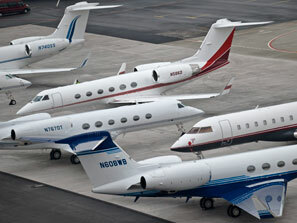 Then head for the nearest private airport and crush all of the corporate jets gathered there. He should of course spare the occupants as they are needed to pay the increased taxes that will get this economy moving again. At least he would make good on one of his promises. Oops I forgot, he did shoot Osama Bin Laden! So as the President takes a vacation and relaxes while most Americans can barely afford to leave home, I believe that we should give the President an assignment to complete while on his retreat. I suggest that the President provide a “book report” to the nation upon his return on the three best ideas he came up with for creating jobs while on his Death Star bus tour. This entry was posted on August 17, 2011 at 2:35 pm. You can follow any responses to this entry through the RSS 2.0 feed. Both comments and pings are currently closed. 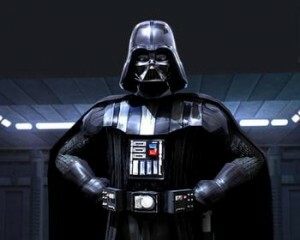 1 Response to "The Empire Strikes Back…the Obama Death Star BusTour!"